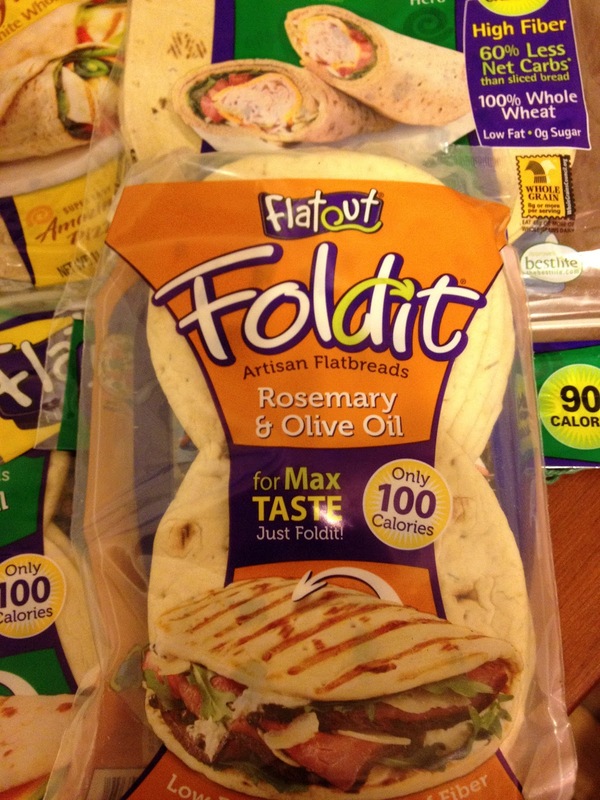 Giveaway Time: Flatout Flatbread Goodies! March Back to Basics Challengers... have I got a treat for you!! : ) Last night when I arrived home from work I found a package on my porch and it was bursting with Flatout Flatbread! 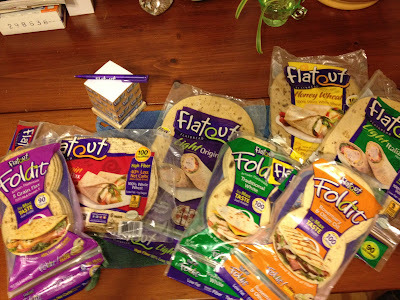 I truly did a little excited dance in my kitchen as I was unpacking the box and discovering all the goodies! Do you remember my mentioning how I've fallen for the Rosemary & Olive Oil Foldits that are only 100 calories? I then shouted out to Flatout on Twitter and they responded BIG TIME! Now I can sample so many of their wonderful products thanks to their generous gift box but here is the fun thing, SO CAN YOU! 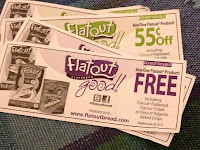 I have a couple of free coupons and a couple more 55 cents off coupons to Flatout delicious artisan flatbreads for the first five #hlgB2B challengers who comment below or shout out on Twitter! This is also my anniversary weekend for starting my weight loss and fitness journey - three years now! : ) I'll be announcing some other really terrific giveaways on Sunday, the actual date (March 19th). 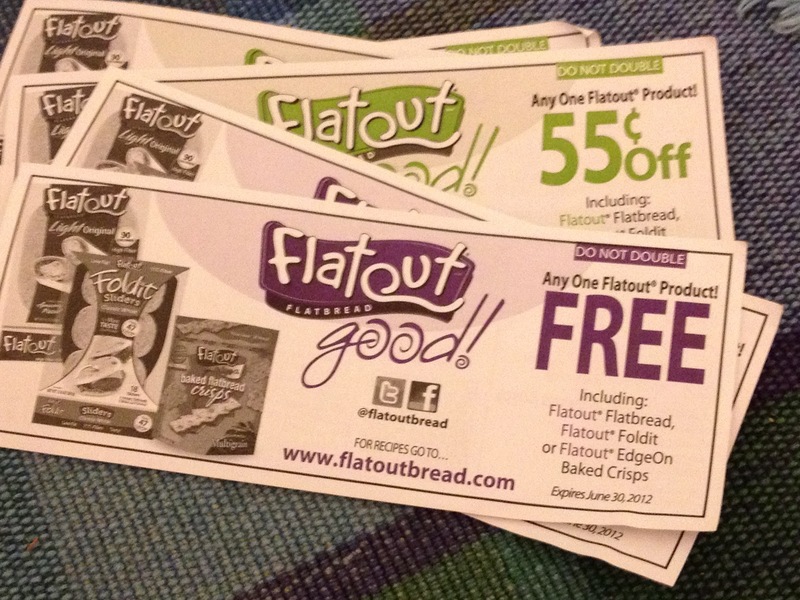 So stay tuned if you don't get one of the coupons, more fun is on the way! FROM 2 YEARS AGO, BUT SO PERTINENT FOR NOW! So my vacation is over and I had a great time visiting my sister in Florida. We hadn't seen one another in a year and a half so it was long overdue. 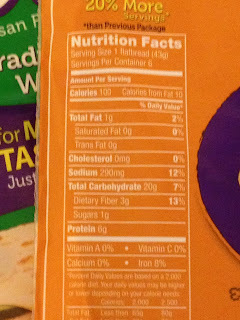 I'm proud to say I stayed completely on plan - even counted calories on St. Patrick's Day for Guinness (I don't like it but feel obligated to drink it on St. Patrick's Day as I am, afterall, of Irish descent!) and corn beef & cabbage & bangers & mash. I made wise, thought-out choices of airport food and even made certain I was online on Tuesday night for my Vtrim class. And I'm soooo glad I made time for the class as it was all about one of my favorite things in the world this past year: Making Goals! Sure, my goal a year ago was to lose 100 lbs. but - in all honesty - that wasn't a very realistic goal as I had no idea how I was going to do it nor was I a contestant on The Biggest Loser! *grin* Losing 60 pounds in a year was much more attainable for me but I would have been happy with 50 pounds, honestly, as in June I was stagnant at 35! It was only then that I started breaking down my goal(s) into 5 pounds lost at a time... THEN it began to work! Then I was making smart goals! I will walk (specific) for a mile (measurable & achievable) on Saturday, Sunday, and Tuesday (time limited) and then try something new for exercise that I haven't done before for 30 mins on Thursday (realistic). Now, for many of you, that goal may seem easy-peasy, huh? But - for me - it is achievable and just enough out of my comfort zone to make it a true goal. I'm not setting myself up for failure. I've already walked the Saturday and Sunday portion of the goal and know I can get to the YMCA at lunch hour on Tuesday. The Thursday part I'm not sure of what I'll do... but I'm going to do it! 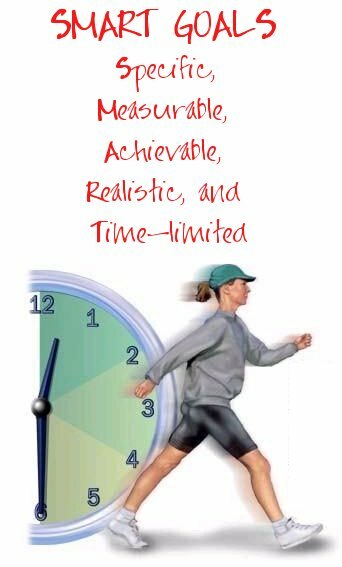 I learned in the online class that we need to ask ourselves "what hurdles do I need to overcome to lose weight?” and then use the smart guidelines to set 1-2 goals a week to help get over those weight loss hurdles. It makes such sense when it is pared down into smaller, achievable goals and I, personally, like writing the goals on my calendar and checking them off when they're completed!! BRING IT ON WORLD, YEAR TWO OF MY JOURNEY HAS JUST STARTED & I'VE GOT YOUR NUMBER! More tomorrow night on my first real encounter with personal training! Parker (my trainer at the YMCA) said "remember this day, Jan, because in a month you will look back and see how very far you've come".